CAPTCHAs, those images of squiggly letters that are a pain to solve, help digitize books, and are increasingly being cracked by bots, are taking a new approach. Instead of being a still image, CAPTCHAs are now being made into videos of moving text so they’re easier for a human to solve but more complicated for a bot with NuCaptcha. The customizability of NuCaptcha is the highly touted feature of NuCaptcha. You can customize the image in the background and the message itself to fit into your website’s current look and use it to advertise your product or an external advertiser’s. You can view a number of different demos, showcasing the adaptability of NuCaptcha, on the NuCaptcha Basic product page. You can enter just the red text or the entire phrase, which might make it less confusing to your visitors. NuCaptcha offers an API and related documentation for .NET and PHP installs as well as a WordPress plugin. 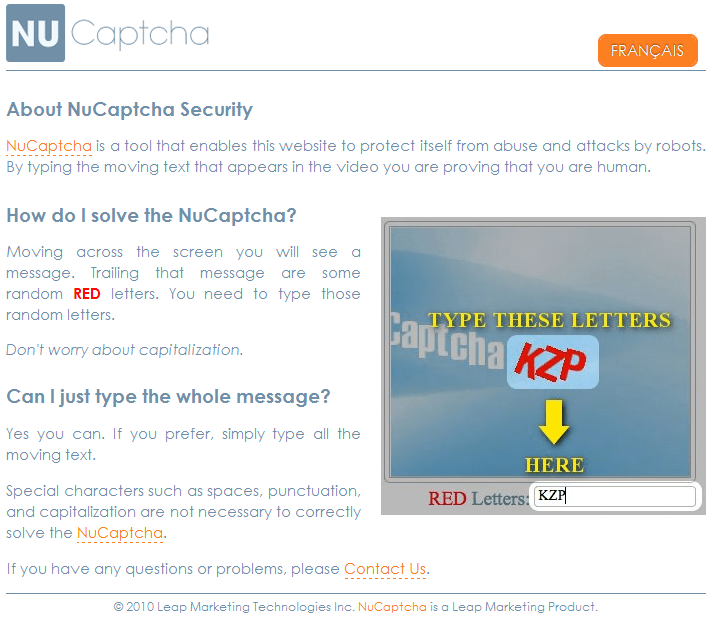 You might look into integrating NuCaptcha into your site if you agree that it will improve your user’s experience. Although, there isn’t any mention about what happens if a user doesn’t have Flash (or is using an iPhone/iPad) you should expect to start seeing these around the web.